Sea Air’s experienced electricians offer a huge range of electrical services across the Sunshine Coast and Brisbane including smoke alarms, wiring, safety switches, air conditioning, and more. Our team provide practical and economical solutions to even the most unusual electrical issue. All electrical issues should recieve prompt attention, book in your service today with Sea Air Electricians. 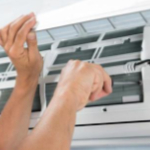 We can take care of all your home electrical needs from single power point replacement to a full air conditioner installation. If the service you are after is not listed here give our friendly team a call on 0417 787 183, we’re sure to be able to help. Why use Sea Air electricians for your electrical needs? We provide quality workmanship and won’t settle for anything less. We’re a locally owned business, we know the area, and great customer service is essential to our business. Our team are experienced, licenced, and insured. All our electrical work is carried out to relevant state, industry, and Australian standards. For the very best in electrical services across the Sunshine Coast from Caloundra to Noosa, contact Sea Air on 0417 787 183 or complete our service booking form today.